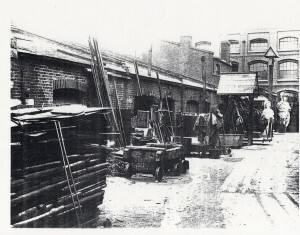 The photograph above shows the rear yard at Castles Wharf in Woolwich around 1910. The figureheads of HMS Cressy and HMS Glasgow can be seen in the far background. The former figurehead of HMS Cressy was subsequently displayed on the new Head Office building in 1914. The latter building is shown in the book cover of the E-Book. HMS Cressy is positioned at pavement level on the left hand side.